Available – All year round. 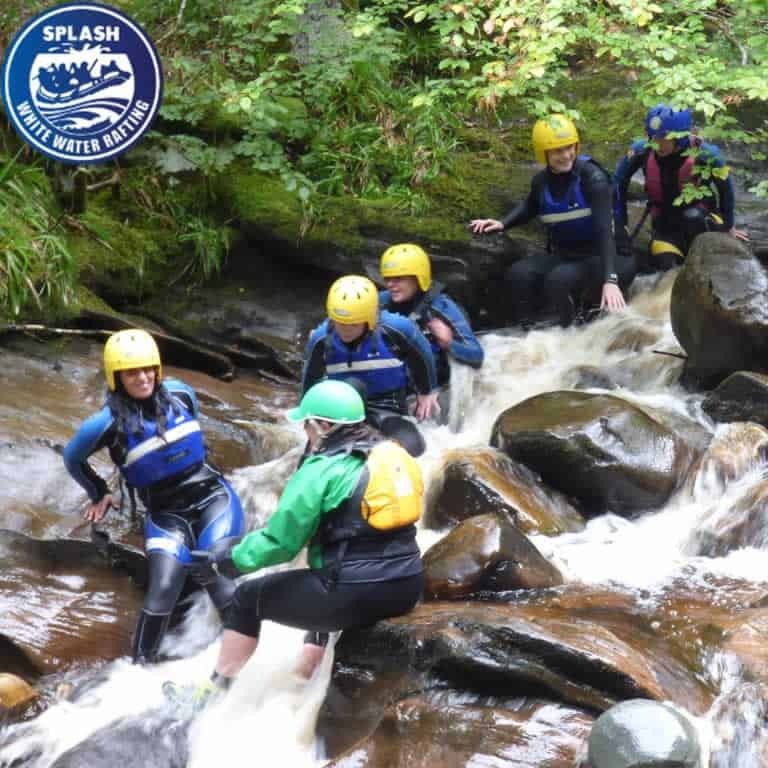 At Splash we have the experience and expertise, we have been Canyoning in Scotland for almost 20 years, we have introduced over 10,000 clients to this exciting, fun and fast-growing adventure sport. 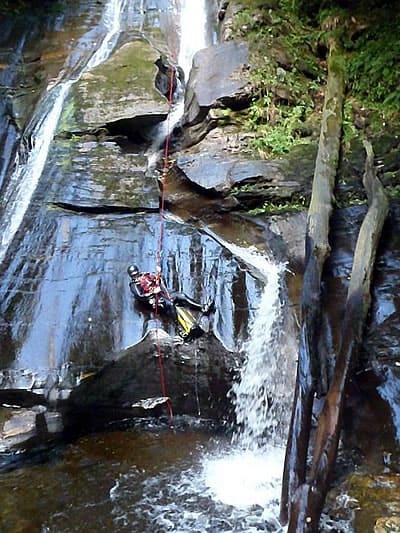 What is Canyoning? 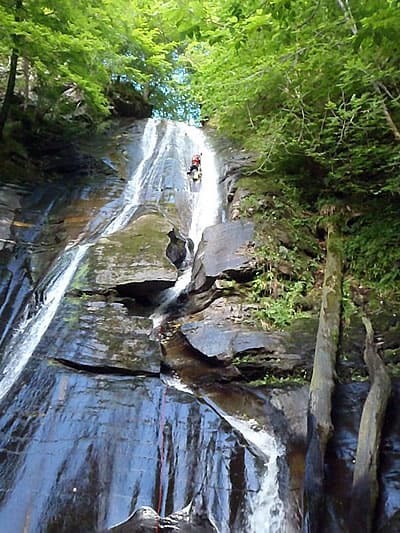 Canyoning is a mixture of jumping, swimming, walking and even abseiling down a Canyon and or River. This is a unique activity that sees you work with our highly trained canyoning guides to descend through a steep gorge or canyon with the flow of water. We only use experienced canyon guides on our canyoning trips. At times throughout the canyoning trip, you will get the chance to jump (from five foot to twenty foot), scramble and swim in amazing natural beauty. Adrenaline will flow and excitement will be had. 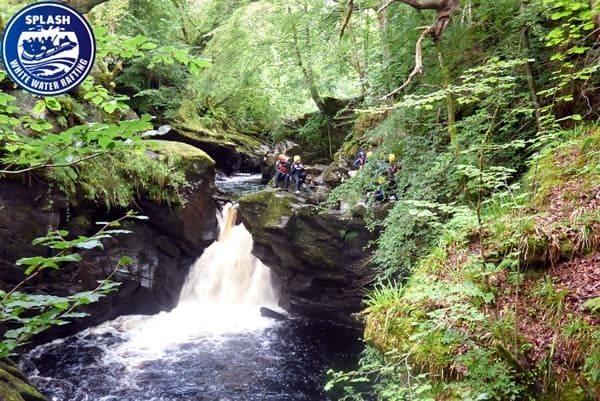 Canyoneering in Scotland is now firmly established as an exciting adventure sport. 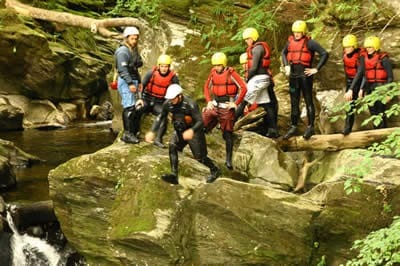 Splash started canyoning in Scotland back in 2003. Since then we have taken thousands of people into our Canyons, not just in Scotland but also in Morocco, Spain and France. Our most canyoned Canyon. It’s fun, fun, fun. This canyon can be tailored for all levels from family groups looking for a fun day out with the kids to a full-on adventure worthy of any stag do or hen party. Jumps from 5 to 25 feet, natural lazy rivers, waterfalls and more. There is a reason why Keltneyburn canyon is so popular, it is amazing. For those looking for the next level up from the Keltneyburn Canyon we have the Acharn!! Acharn has a large waterfall abseil of around 25 metres! !, plenty of ropework, climbing, technical jumps, natural slides and lots of swims. Located above Loch Tay on a short drive from our HQ in Aberfeldy. Canyon Special Deals Available every Tuesday and Thursday! If you are looking for other canyoning experiences/adventures in Scotland contact us via email to find out about our other Canyoning locations. This selection of Canyons will delight even the most dedicated canyoneer / canyoning enthusiasts. We have a dedicated canyoning site which currently has over 12 Scottish Canyons listed with more to come, ranging from beginner to advanced. Combine your Canyoning with another Splash activity and save! Why not try out rafting river bugs or river duckies? A full day of adventure on the river and in the canyons cost from just £85 per person – guaranteed excitement and exhilaration suitable for the whole family! The canyon is scenic with a great variety of jumps all building to the brown pants finale! Aivars is an excellent guide and really adds to the whole experience. The man is filled with humour and made the day a delight from kit check till the end. We love latvia! Went on our second adventure with Splash after a very fun and exciting Rafting Experience on the River Tummel last year. This year we chose Canyoning and opted for the most challenging on offer which was the Acharn Canyon. It was an excellent morning out. Pretty challenging with some moments where you are pushing yourself, with big jumps and a big abseil at the end. very well organised, with fun and helpful guides. 1. it can be pretty slippy in places so where trainers with a bit of grip instead of really old ones with no grip. 2. Not for wimps. Peter told us it was challenging and up heights, a couple of the jumps and the abseil. That being said if your an adventure sports fan, you will love it. On every Canyoning trip, we include all equipment required plus a professional experienced guide. A logistics manager on land who is also a very experienced guide. All equipment required which includes over £150 worth of wetsuits, helmets, lifejackets. Transport from our base on and off the river/ canyon by a professional bus company. You will be provided with everything you need to Canyon safely. However we do ask you to bring an old pair of shoes to wear on the river (These will get wet), and your swimwear for underneath your wetsuit. Optional – a non-cotton T-shirt (synthetic materials are best ) for under your wetsuit. Depending on the time of the year warm clothing for before and after your trip.